In collaboration with Charles Gaines: Gridwork 1974–1989 at the Hammer Museum, Art + Practice presents Charles Gaines: Librettos: Manuel de Falla / Stokely Carmichael at its space in Leimert Park. Employing a systems-based conceptualism that Gaines has long embraced and highlighting the enduring influence of composer John Cage’s experiments with chance, the new 12-part body of work brings together the score of a tragic love story, the opera La Vida Breve (c. 1904) by Spanish composer Manuel de Falla, and a fiery 1967 speech by the civil rights activist and Black Panther Party member Stokely Carmichael. The unexpected combination of music and text foregrounds the universality of long-standing class and racial struggles and the power of music to bridge difference. Charles Gaines: Librettos: Manuel de Falla / Stokely Carmichael is organized by Anne Ellegood, Hammer senior curator and Jamillah James, Hammer assistant curator. Charles Gaines (b. 1944) received his MFA from the Rochester Institute of Technology in 1967. Over the course of his career, he has been represented by Leo Castelli Gallery and John Weber Gallery, New York; Margo Leavin Gallery, Los Angeles; Young Hoffman, Chicago; Richard Heller, San Francisco; and Galerie Lavignes-Bastille, Paris. He is currently represented by Susanne Vielmetter Los Angeles Projects and Paula Cooper Gallery, New York. In 2013, he received a John Simon Guggenheim Memorial Foundation Fellowship and presented a critically acclaimed solo exhibition, Notes on Social Justice, at Paula Cooper Gallery, New York. In 2012, Gaines was the subject of a mid-career survey at the Pomona College Museum of Art and the Pitzer College Art Gallery in Claremont, California. His works are in the collections of the Hammer Museum, Los Angeles; Museum of Contemporary Art, Los Angeles; the Museum of Modern Art, New York; the Whitney Museum of American Art, New York; Los Angeles County Museum of Art, Los Angeles, Lentos Museum, Linz, Austria; Galerie der Stadt Esslingen, Esslingen, Germany; and Villa Merkel, Esslingen, Germany. Gaines’s work has been featured in recent major group exhibitions including Blues for Smoke (Museum of Contemporary Art, Los Angeles, 2012) and Now Dig This! Art and Black Los Angeles 1960–1980 (Hammer Museum, Los Angeles, 2011). He has participated in the 2014 Montreal Biennial and the 2007 Venice Biennale, as well as group exhibitions at the Los Angeles County Museum of Art; Museum of Contemporary Art, Los Angeles; Hammer Museum, Los Angeles; Lentos Museum; Deichtorhallen; Kunsthalle Basel; Contemporary Art Museum, Houston; and REDCAT Gallery. Gaines has published several essays on contemporary art, including “Theater of Refusal: Black Art and Mainstream Criticism” (University of California, Irvine, 1993) and “The New Cosmopolitanism” (California State University, Fullerton, 2008). He currently resides in Los Angeles and has been full-time faculty in the School of Art at the California Institute of the Arts since 1989. Conceived and founded by artist Mark Bradford, philanthropist and collector Eileen Harris Norton and social activist Allan DiCastro, Art + Practice (A+P) is an arts and education private operating foundation based in Leimert Park, Los Angeles. A+P’s mandate is to create a developmental platform that, on one hand, supports the acquisition of practical skills for foster youth, and, on the other, stresses the importance of creative activity within a larger social context. In a career spanning more than four decades, the Los Angeles–based artist Charles Gaines has become known for his conceptually rigorous and formally compelling explorations of the relationships between aesthetics, systems, and cognition. In his early conceptual projects, Gaines employed rules-based procedures to generate series of works composed of multiple panels. Often combining photography with drawing, he turned to the grid as a foundation, producing drawings that are notable for their meticulous, labor-intensive rendering of numbers and lines. Moreover, Gaines’s artistic output has been greatly influenced by the composer and artist John Cage’s use of chance and indeterminacy; the repetitive, minimal compositions of Steve Reich; and his own background as a jazz percussionist. In recent years Gaines has examined the relationship between music, politics, and speech. Librettos: Manuel de Falla / Stokely Carmichael is the first set of works in a new series in which he continues his exploration of systems, using musical composition and notation as an organizing structure. Whereas repetition and accumulation are critical to his earlier bodies of work, Librettos layers two distinct sources, allowing unexpected connections to emerge. Manuel de Falla / Stokely Carmichael brings together the score of a 1904 opera—La vida breve (Life is short) by the Spanish composer Manuel de Falla, which tells of a love affair doomed by social mores and class differences—and a 1967 speech delivered in Seattle by Stokely Carmichael, in which the civil rights activist and Black Panther Party member argued that African Americans should not serve in the Vietnam War. In earlier works Gaines combined photography and drawing to closely evaluate how familiar objects—trees, plants, the human body, and the written word—are represented. Photographic imagery is transposed by hand onto gridded paper, the outlines of the subject often rendered using sequential numbers rather than a simple line. 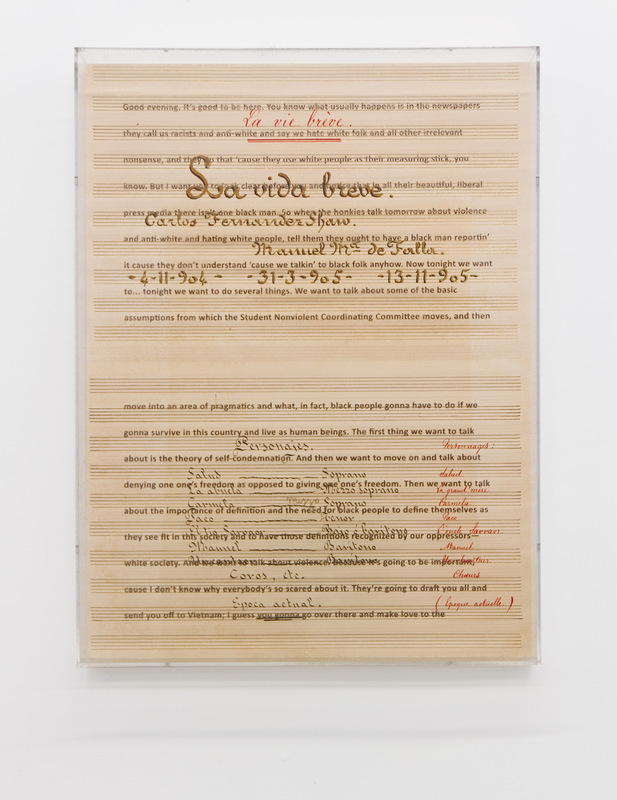 In Librettos, as in his recent series Manifestos (2008–) and Notes on Social Justice (2012–), text replaces numbers as the measure of process and duration. The Carmichael speech, which advocates the right to dignity and self-determination in the face of oppression, functions as the libretto (or lyrical text) for the opera, which was originally written in both French and Spanish. The tragic opera details the secret relationship between the wealthy Paco and a lower-class woman, Salud. After a confrontation at her lover’s wedding to a woman of his social class, the heartbroken Salud suddenly dies. Pairing the opera with Carmichael’s speech—which has a certain musicality because of the skilled orator’s use of repetition—reveals affinities between these seemingly disparate sources. The unexpected combination of music and text foregrounds the universality of class and racial struggles. Carmichael argues that the continued oppression of African Americans is rooted in economic and educational inequality, while de Falla’s opera serves as a cautionary tale about the polarizing social implications of class distinctions. Librettos: Manuel de Falla / Stokely Carmichael reveals the political content of an artwork that is more than a century old while inserting Carmichael’s speech into another form so that viewers can consider his words anew. Hammer Museum at Art + Practice is a Public Engagement Partnership made possible by the James Irvine Foundation. Public Engagement at the Hammer is a curatorial program dedicated to developing artist projects that create an exchange between visitors and the museum. Enacted both inside and outside the galleries, Public Engagement projects range from an experiential installation focused on housing in Los Angeles to residencies with a lending library and an experimental orchestra. The Hammer Museum’s Public Engagement program is supported, in part, by the Los Angeles County Board of Supervisors through the Los Angeles County Arts Commission.